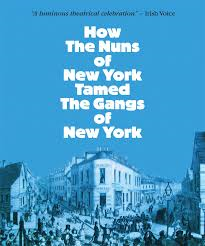 How the Nuns of New York Tamed the Gangs of New York — Who are the Secular Franciscans? An explosive new work about the waves of 19th-century immigrants from Ireland, including thousands of orphaned children, escaping hunger and disease. See how the Sisters of Charity of New York rose to the occasion and left a timeless legacy of rebuilding lives. Experience this celebration through music, dance and true stories. Tickets are $22 each, and must be purchased in advance. Meet us at the Loreto theatre, or take the Express bus with us! Contact Joanne Malick before February 10th.